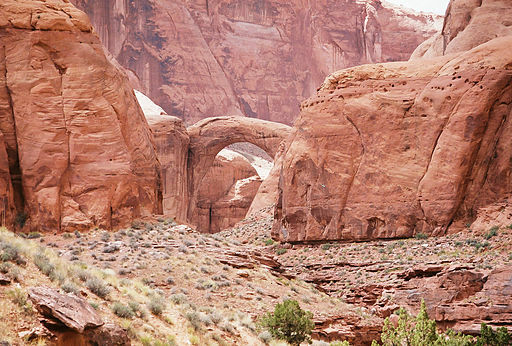 Rainbow Bridge in Utah described as the world's largest natural bridge. 11-12-05 Wikimedia. Being fully realized means to be fully present. It does not mean you become numb or sit on a mountaintop with your palms up unless that is your conscious choice. It means you are living a full and happy life. A great functional test of our realization is the extent to which we are disturbed by life events. Notice if you are reactive to what is happening to you. How often do you become overly emotional in facing decisions in your life or situations that bring challenges with them? As you move through my course, you will find yourself catching yourself sooner and sooner in the process of reaction until one day, you too will find yourself non-reactive and fully realized. And the fruit of better relationships, more money, and more health follow realization. How do I create in the world? Why is creation easy when you are Being Present - in the zone? And how do I get myself out of the way to allow creation to occur? Yes, you've been in your own way making it harder on yourself! How do I allow myself and my health, my wealth, and my loving relationships with others to continue to grow? - How do I become wealthier or how do I maintain what I have and allow it to grow? - How do I become healthy or fit or remain healthy and fit? - How do I develop and maintain loving relationships? - How can I become a fully loving person? - How do I maintain so-called "presence" on a continual basis and experience unconditional happiness? And what is that exactly? After all, what good will it do to create and accumulate "things" if you are not also happy? If you have been able to accumulate things and still lack happiness, this course is for you, AND if you haven't been able to experience good things in your life and are unhappy, this course is for you as well. See how it can be that you can be well provided for and be happy at the same time. Have you considered what you are thinking now about your goals for this year? Do you think they'll all come true? Do you expect to earn more and/or make money from or preserve your assets? Will your relationships improve this year with healing of any tensions that may exist? Do you expect that you will be healthy or do you expect issues to arise? And how do you feel about it? The last question is the most important one, because it's not actually the thought by itself that creates our experience. It is the combination of the thought and the feeling that determine our results. Now you may say, "But there are so many things beyond my control this year. It's a tough economy!" Or "My body does not seem to cooperate!" But where do you experience "the economy" or your body other than in your own thinking? I would ask you to see if it isn't true that you experience the economy, your body and your level of wealth in terms of your own thoughts and feelings. So what's the point? The point is that because your experience is a reflection of your thoughts and feelings, if you look at them and transcend them, you can then allow all your goals to be FULLY REALIZED. And to top that off, you can enjoy what you are doing! Yes, you may have noticed that I said "allow" your goals to be fulfilled. If you insist on doing things the hard way, by holding negative thoughts, you will likely experience having to make a great effort to get the same job done that otherwise could be nearly effortless. Have you ever had the exact person you needed just show up in your life at exactly the right time without your doing anything? You likely have. How do you imagine that happens? There is an alignment between your allowing them to show up, and their allowing you to show up for them. In the same way, you can now allow health and abundance to show up for you as well. So how can you address feelings of negativity in real time? That is what the course teaches you. Why react to people and situations when we don't need to? It causes us and others a lot of unnecessary pain and upset that is avoidable. Why not maintain your sense of peace at times when situations and people challenge you? The FullyRealized Course™ gives you specific and powerful methods of examining your thinking and transcending any negativity, so you can allow for the best results in your entire life experience. Can it help me invest and use my money with greater happiness and success? Yes, it can. By addressing negative thoughts about the various markets, savings, spending, and income, you will learn to create "through you" from a place of peace and clarity. If you are confused about the economy and the markets lately, that is something that this course will address. Confusion is a form of reactivity. What we intend to do in this course is to give you unique methods that you can use on your own to achieve what I like to call "Unconditional Happiness." The result is success in your whole life, including health, wealth growth and preservation, and loving relationships. What about other areas of my life like health and relationships? Since it works on thoughts and feelings in any area of life, it will help you improve those areas as well. For example, I will show you how to deal with body pains while taking less or no medication as well as address any other health issue. In the realm of relationships, you will learn a powerful method of preparing for an important meeting or discussion with a client, friend, or family member, so that you will ensure the best possible outcome IN ADVANCE. Why be surprised during the discussion, if you have a way to ensure success by preparing yourself ahead of time? Do you experience unconditional love for AND from your significant other, friends, and family? If not, we'll show you how to get there. Being healthy in body and relationships is clearly critical to a successful life. That positive experience in health and home feeds back into your success in your investments and general flow of financial well-being in your life. And good things start to appear in your life. When you raise your consciousness, you'll leave home with a smile on your face, and you will be far more likely to bring one to the world, right? And how will the world respond if you are at peace with yourself? How is the course offered and what about follow-up after the course? I am Dr. David Durand. I respond to David too! After you finish with the homepage, please see my "About the Author" page for my bio. My introductory course is being offered currently on a one-on-one basis as a five session non-business or business course, whichever is more appropriate to the work you are interested in doing in applying the course to your life. 1. The basic non-business course given individually will take five 90 minute sessions. These five sessions are offered at the discounted price of $997. Use the contact box below or call me at 424-234-6401 to sign up for the individual course. Note that you should choose "option 2" below, if you are interested in the "Lead In Presence™ Mastermind" program or if you wish to work on your business during our work together. If you do not wish to continue after the first session and it is before we have started the second session, you can request a refund of the course fee minus $197. The course gives you tools that will last you a lifetime as well as an opportunity to raise your consciousness in regard to your most pressing issues. 2. "Lead In Presence™ Introductory Course" for CEO's and business leaders, practice leaders, and entrepreneurs. This individual course is required for entry into the "Lead In Presence™ Mastermind Program" in which I guide you and your business to higher consciousness and exceptional results. This program is only for those interested in total business and life mastery. I work with only a small number of people in this program, because of the time required. Click here to read more: Lead In Presence Mastermind Program™. If I am at full capacity, there is a waiting list, but you can begin with the Lead In Presence™ Introductory Course described above. I also offer individual coaching sessions on a fee for service basis after you have taken one of my introductory courses. Sessions are priced to give the maximum savings to those clients who wish to work with me in a committed way (please call me for more information). I have found that they make the most progress and have the greatest results. Among my best clients are CEOs, professional practice owners, and other committed non-business people who are dedicated to their own growth. They want to get better results in their work and businesses, improve their relationships at work and in their personal lives, and be both fit and healthy. If you have the same desire, please consider joining me in this sort of transformational experience. It has worked for me and my clients, so I offer it to you. Anyone can do this work if they have the desire. That is the one desire that will free you rather than bind you - the desire for personal growth and freedom! I have personally spent tens of thousands of dollars on personal growth after college and medical school. In addition, I invested years in developing the methods that I now teach. Why would I do that? Because all aspects of my life improved and my wealth went UP, not down. They never taught me the important stuff in college or medical school. The work I did was worth every penny and as I said, it paid for itself in the expansion of my wealth, health, and loving relationships. I want to spend my time with those who truly want to change and become the best they can be not only for themselves, but for their children, significant others, those they work with, and the rest of the planet for that matter. Why not? Life is so much easier when you raise your consciousness. I've proven that out in my own life just as my clients have. As I said, everything works better from health to relationships to money. Mind body healing work (see the Mind Body Healing link to the above left) is offered as the Mind Body Formula™ Course, a course that you can use to heal for the rest of your life. It is a combination of the basic course and my Mind Body Formula™ teachings. To read more please go here: Mind Body Healing Work. You can do the entire "Mind Body Formula™ Course" as an individual course for $997. Please call me for a free "My Path to Healing Strategy Session™ to see if the course is a fit for you at 424-234-6401 (9 am - 7 pm ET). Why don't I just "heal you"? Because I want to empower you to heal rather than "do something to you" to make you heal. I will not support the healing model that says "I heal you." That was good enough for the past, but is no longer rational or compassionate as it disempowers people. There are plenty of healers still around who will "do the healing for you" and that is fine, but not here. In this course, I show you the way. It is my personal belief that the enlightened who have left us would be dismayed to see that the world had still not evolved past the level where they were working 100's and thousands of years ago. It was said by Jesus, "By your faith you are healed." But few hear that, believing someone else should give healing to them without being engaged themselves. It is time that we all take individual responsibility for knowing the truth that can set us free from limitation. And that starts here. It starts with your physical healing. Are you with me on this? Can we uplevel the truth now from the past and move into the 21st Century in a new way? My belief is that the answer is "Yes!" I wish to add that I do not doubt the compassion of those who believe they are helping people by "healing them" without the patient having any understanding themselves. At that level of consciousness, compassion is still needed. Seeing that someone can do something to your body or life that appears miraculous is a step up in consciousness for those who need it. This is simply not where I was meant to work, nor you if you join me in raising the bar to the level of Conscious Healing™. If you are in need and cannot afford this work, please call me and we will reach a mutual agreement on payment. When paying for services, please refer to the pricing comments above. Enter the price in the payment box or call me for payment information if needed or if you have any questions about the courses. The payment or "Buy Now" button below may also be used by anyone wishing to give as a thank you or tithe for what you have learned from this site (For those interested, you can read my comments on tithing below the payment button.). Let me know how I can be of help to you by calling me at 424-234-6401 (9 am - 6 pm ET). NOTE: "Universal Ideas," my company name, will appear on your credit card statement. Please note that I will be paying taxes on all regular payments as well as gifts of thanks and of tithes. I am grateful to you for coming to do this work. Tax exempt organizations are required to have a board and at this time, my wish is to keep things very simple, so I am not running a tax exempt organization at this time. Thank you for your understanding. What is the theory behind the method taught in this course? Why does it work? You cannot create happiness? Why? How do we fall out of happiness and how do we return to happiness? What does Eckhart Tolle, the author of "The Power of Now," and "A New Earth" (featured by Oprah) say about being presence to deal with feelings of unhappiness? If I receive traditional medical therapy, medication, and/or surgery, what can I add by looking at my thoughts about my illness? And what is the Mind Body Formula™ and Three Step Healing™? What do your students say about the course? What are their results? Could you tell me about the author? Call me at 424-234-6401 between 9:00 am - 6:00 pm ET weekdays (please send a message via the contact box after hours or on the weekend), and I'd be happy to answer your questions about the course, individual healing work, or any other issues of achieving presence in your life. If you would like to be on my email list to be notified of new blog entries and live course updates, please enter your email address in the box near the top of the page. Parenthetically, I believe in giving 10% or more of all income received to the source of my spiritual good and to charity (some would say giving to charity is "extra" as I explain below). This practice of tithing reflects my commitment to abundance. It is spiritual law that is reflected throughout many religions, which is why it is often looked upon suspiciously no doubt. I share this with you because I wanted to explain why I would ask for support of the work that I do. I ask, because I am sharing my practice with you and the insights into why it is so liberating. Not asking would not be in integrity for me. In an addictive life of materiality, abundance can be negative, but in a transcendent life, abundance is always liberating. Abundance and success flow from the nature of Presence. And tithing is one of the ancient "secrets" of abundance. If you are looking for a clear explanation of the power of tithing to the source of your spiritual good, take a look at "The Four Laws of Spiritual Prosperity" by Edwene Gaines. Decide to take the "spiritual medicine." It is one of the clearest explanations of tithing I've encountered. Joel Goldsmith, a realized being in the experience of Eckhart Tolle and others also taught the power of tithing (E. Tolle recommends Joel Goldsmith's books). Joel gave much more than 10%. His abundance just continued to increase as he increased the percentage of his tithe. I, like others, did not always receive this view favorably in the past. Hearing ministers on TV demanding tithes did not warm my heart. But I now see they were right. Edwene points out powerfully that spiritual law does not care whether you believe in it or not! It still has its activity in your life. If you give, you receive abundantly, not in dribs and drabs, but we are told "heaped up, pressed down, shaken together, and flowing over." The only way to know is to try it and see if it works in your experience. Only you can prove it for yourself. If you say you cannot give because of x, y, and z, God/Source unfortunately does not care. When you say "I cannot afford to give," God/Source takes you at your word. Nothing much comes back to you either. You are holding in mind lack and you create it. If you feel irritated by all this, take a deep breath and read on. It is spiritual medicine only if you can get it down! We don't take medicine because it tastes good. Why the 10%? I believe 10% has spiritual meaning, since when you receive back 10-fold what is given, you reconstitute "one" or the entire amount from which you gave. Secondly, 10% is an amount that is enough to push our buttons if we have any resistance to giving. This is likely the most useful aspect of tithing. It forces you to transcend your limiting thinking about money which says "I don't have enough to give 10% of it" and you suddenly find yourself in the abundant flow of God/Source. Of course, give out of love, but if you don't give, spiritual law says you will create the same lack that withheld the money in the first place. The consciousness of "I don't have enough to give 10%" is that which creates lack. If you withhold money, the God/Source does too. Yes, I know this is tough to buy into at first. But will you prove it wrong at least, or will instead go on in the status quo of lack wondering what you have not done to activate the flow of abundance in your life? Joel Goldsmith taught that "Giving is supply." What you get is just a side effect of giving. The energy of giving leads directly to the physical appearance of supply through the One God/Source. Try it. You will like it. And as Malachi 3:10 states "the windows of heaven will open and pour you out a blessing that there shall not be room enough to receive it." Sound like a good deal to you? Prove it wrong! Take 6 months Edwene suggests and prove it out or disprove it. If it works, you will keep doing it. For the "how to," I recommend her book. There is one key that should be mentioned though. You can give to charity and we should be compassionate toward the desperate immediate needs of others, but that is not part of a tithe at least in the opinion of some. For example, Edwene says tithes should be given to the source of your spiritual good, meaning your church, synagogue, mosque, your spiritual mentor, a person who uplifts you spiritually such as a friend or even a relative or an enlightened waitress in a restaurant in one example Edwene gives. You divide it for the week according to the sources and their impact on your spiritual growth and understanding. Charity giving is in addition to tithing. Take a deep breath! Why give to the source of your spiritual good or uplifting to a higher consciousness? Because it is in Oneness with God/Source that your abundance is achieved in the first place. You've heard the expression: "Get God first." The point is to raise your consciousness in this world and allow all the abundance, health, and happy and fulfilling relationships to pour down upon you. Life is a celebration of your Oneness with God/Source. It does not matter where your spiritual good comes from. You give it to that source that uplifts you spiritually each week as you have income and you take it off the top (gross before taxes, not net - like the challenge to "Love all," truth is not always easy for us to take in!). Some say that if you give to charity, you are in fact giving into a state of lack, because you are teaching those receiving your money that they don't have the power to create it in their own lives. But it IS compassionate to alleviate suffering and to support those in need with the means to provide for themselves; nevertheless, that is not part of a tithe, which must be directed toward the sources of your spiritual good at the moment, which could be multiple. You give out of compassion to charity in addition to your tithe. Deep breath! I personally believe that one can give to charity as a part of a tithe, because compassionate giving is given to the world that overall helps us to raise our consciousness. Make your own decision on that issue of course, while remembering that "giving is supply." Even Robert Adams, another free being who lived in the highest consciousness, spoke of this principle of supporting the source of your spiritual food or good in his talks recorded in his book "Silence of the Heart." He left it for the end of the book, because he knew it was hard for students to understand and feel comfortable with. Jesus was aligned with tithing as well. It was already part of the Jewish tradition and he supported it. If you have resistance, transcend that resistance and do what comes to you to do. Some may say I have no business talking about this in the context of realization of Presence, but I would disagree. If you have resistance to giving, which is in the nature of Beingness to do, how would you possibly be able to become One with what you are? You could not. So "acting" like it serves a purpose in self-realization. If you practice any of the "qualities" of Beingness, you ready yourself for being One with God/Source. But the point of this discussion was to reveal an ancient secret of abundance, not to tell you what to do. It's your money and your business. Do what comes to you to do, but if you do not achieve abundance in your life, you might try tithing for 6 months. I do not recommend giving or doing anything in a state of resistance. Become present with the act of tithing and giving of any kind. Don't believe what I've written, your local religious leader, Edwene, Joel, Robert, or anyone else if you are skeptical. Prove it out yourself as a law. You'll likely have the answer in 6 months, perhaps even sooner. And please email me about your experience if you are willing. I will never share your story without your permission and can do so anonymously if you like. I'd love to hear from you. Please contact me (Dr. David Durand) at 424-234-6401 between 9:00 am and 6:00 pm ET weekdays to schedule a free strategy session, so we can determine the best course of study for you or email me using the Contact Form below. © 2009-2015 Universal Ideas, LLC All rights reserved.